Sleep in the trees during your next outdoor adventure with MSGR’s camping hammock rentals. Hammocks let the sleepy catch zzzs anywhere they please, whether suspended in the air or spread on the ground like a tent, if there aren’t any trees around. Hammock rentals come with attachable bug nets and rain-flys. 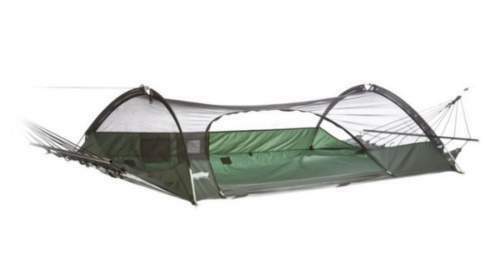 It comes complete with a no-see-um bug canopy, a rainfly that attaches directly to the hammock, and a spreader bar and arch pole system to keep the bed of the hammock flatter and tauter. No banana effect around your campsite. And one more thing, its versatile. You can use this on the ground like a tent, if there are no trees around. MSGR includes the Tree Hugger set of hammock straps with this camping hammock. It comes to you ready to go. Who wouldn’t want to sleep over a river or not have to worry about uneven terrain or rocks? Packing Size: Packs to: 22inx6 in.